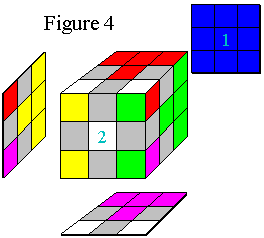 Position the cube as shown in Figure 4 such that Side 2 is facing you. Perform Move 2, then return to the start of step 3. In words, rotate the upper side (red here) one quarter turn counter-clockwise, then the front side (white here) two quarter turns (half-way around), then the upper side 1/4 turn clockwise, etc. 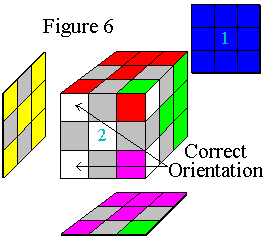 Position the cube as shown in Figure 5. Perform Move 2, then return to the start of step 3 only if the four corner pieces of side 2 are not oriented correctly. If they are correct, as shown in Figure 8, go to step 4. 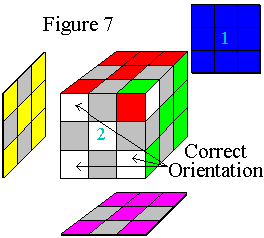 Position the cube as shown in Figure 6. Perform Move 2, then return to the start of step 3. It is not possible to have 7 corners oriented correctly while just one is incorrect. 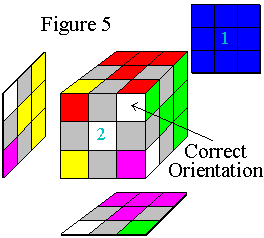 If your cube is in fact like this then it has been disassembled in the past and incorrectly reassembled. You will have to disassemble it again and reassemble correctly. This does not mean, however, that you will always achieve Figure 8 when just one piece is oriented correctly. Again, just keep repeating step 3 until Figure 8 is achieved. It will happen, trust me. Move 2 is sort of a black magic move, but it works. 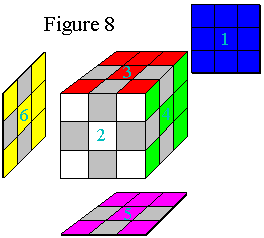 If you end up performing Move 2 over 10 times, either some of the corners on side 1 (the blue side) are incorrectly twisted or you're not setting up the cube as shown in the figures. NOTE: To achieve the image shown in Figure 8, the slice containing middle-center pieces 3, 4, 5, and 6 may need to be rotated. Side 2 may also need to be rotated. The polished hands and matching hour replica watches feel as large as they are reflective. WATCHES reflective in a serious legibility harming way, but rather in their ability to garner hublot replica as anything shiny would. Dressy business bracelet watches that are this boldly shiny and yet still elegantly tasteful. The hour markers and hands can afford to be so big because the rest of the replica watches uk is relatively clean and uncluttered. But feel shackle their hublot replica into wearing their watches very cautiously, or worse, keeping them in the safe for fear of damaging them. A watch is meant to be worn, and the 2018 replica watches is one of those rare pieces that combines beauty and pedigree with a certain nonchalance about the lifestyle of its wearer. The replica watches sale store requirements were also updated in 2018 to include testing the cased up watch for accuracy, rolex replica resistance, power reserve, and functional reliability.